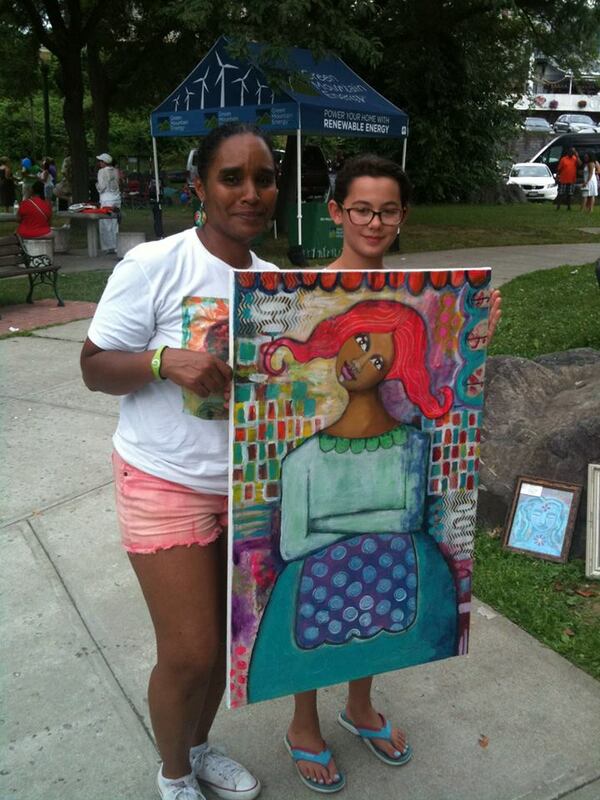 Milagros (Millie) Suriano-Rivera, artist, inspires me! 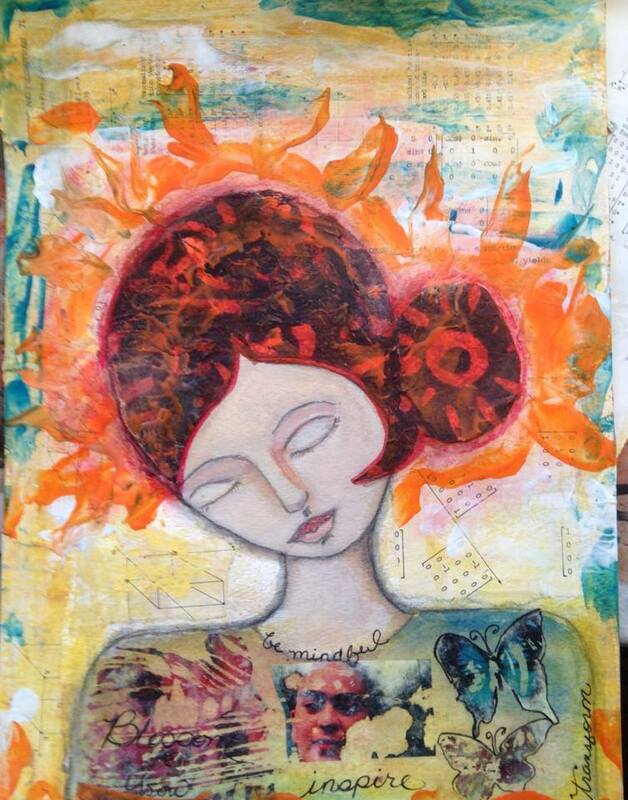 Behind our girl/woman is a patchwork of newsprint, bubbles, circles, Xs and Os. Behind all women there are many back stories, unexplained or overexplained scenarios, patterns, styles, habits. I wish through this flat screen that you could touch the texture of this work of art. To caress the layers and feel the bumps of glue and paint that hold it all together. I want to create this kind of collage, a layering of meaning and a build-up of patterns. We are always building our last layer. Sometimes we get stuck in an old pattern. We think we are done, but it is only a foundation for the next layer. Also by Milagros Suriano-Rivera, my former colleague. I have a pattern of apologizing for the messiness of my work, my art, my life. Collage appeals to me because I am patching it together, painting over that last round, gesso-ing (whitewashing), getting stuck, then starting over. I do not need to apologize. 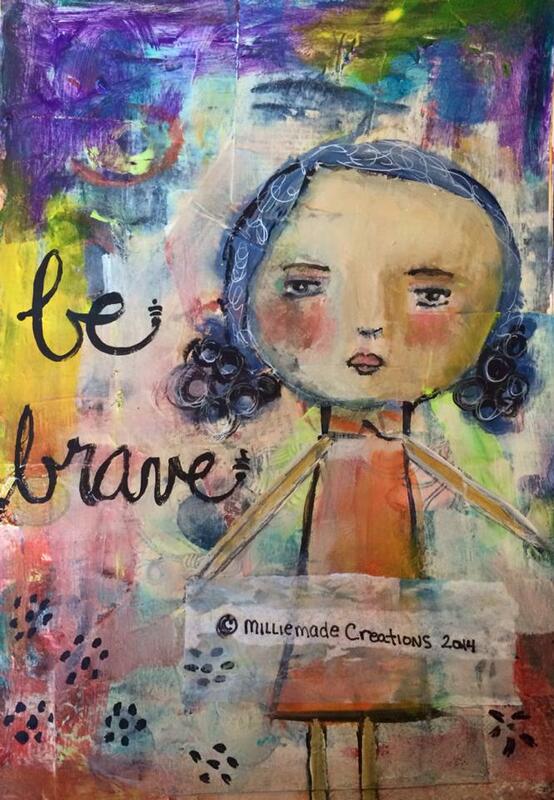 Life is mixed media – messy and doodley. Made with pens, colors, words, fabric, papers. I have been letting go of scraps, wondering as I give away books or clothes, What was I doing hanging on to this? When I die, I do not want my children saddled with all my stuff. Discard. I will have a harder time when I come to all my journals, some with writing, some with art. I have hundreds of them. I want to patch together my stuff and make it beautiful. I like making art. Times when I am always happy? Paintbrush or bike handlebars in hand. I am also happy when I am hugging someone I love. You need seven hugs a day my yoga teacher told me. Making art is a little like hugging – or making the paper hug the paint or fabric or mixed media or glue. “If it is too simple, complicate it. If it is too complicated, simplify it.” Mariano Rosario, my mixed media teacher at the Art Students League, told me. This post was written at the Ecumenical Library Writing Group. We were shown a mixed media collage by my former colleague, Milagros (Millie) Suriano-Rivera. Alicia Pitterson led the writing group. She asked us to look at Millie’s painting and write about what resonates. We meet next on August 24 at noon. Here’s Millie on the left selling one of her works at a street fair.